June 8th, [gaokao university entrance exam] test-takers exiting the examination sites. Shen Fei’s relatives were waiting outside the exits, but the only people not amongst the crowd were his parents. 12 days ago, after Shen Fei’s parents had gone to the school for a meeting/conference for parents of this year’s test-takers, they suffered an unfortunate traffic accident on their way home. 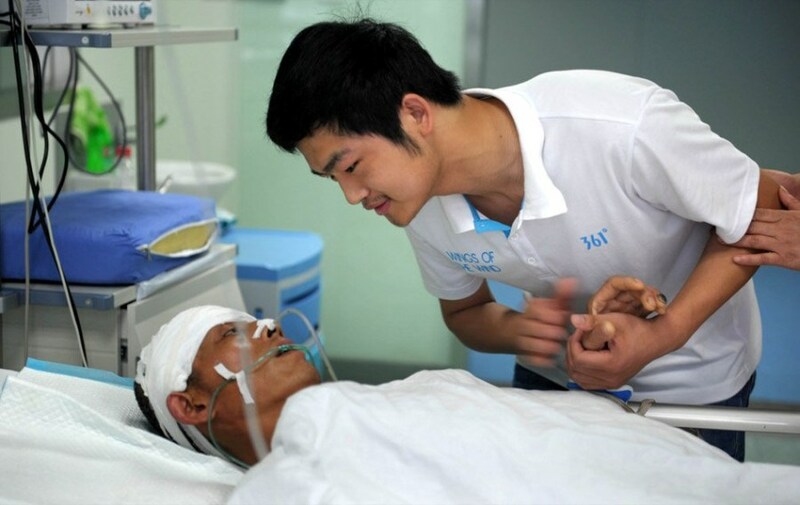 His mother died after unsuccessful efforts to save her life at the hospital, while his father to this day is still lying in the intensive care unit. In order to let Shen Fei take the gaokao without distractions, family members, traffic police, and the school collectively organized a lie/deception. 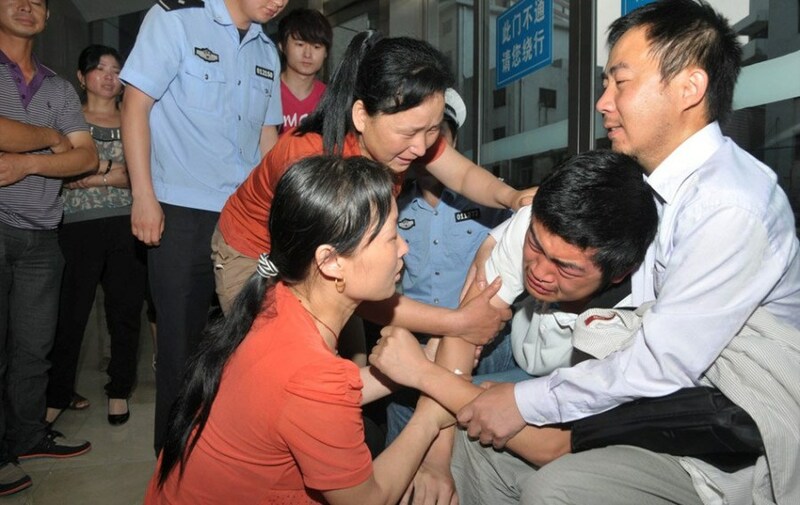 Photo is of a school teacher comforting Shen Fei. Upon learning of his mother having passed away, Shen Fei in grief. Shen Fei holding his father’s hand, saying he had done well [on the test]. Afternoon of the 8th, Shen Fei’s maternal aunt waiting outside of the examination site for him to come out. Shen Fei did not learn about his mother’s death until after first seeing his father. What use is “winning” the gaokao when you’ve “lost” your mother?! Even if he didn’t take the gaokao he still would’ve lost his mother. To learn the truth later is always more difficult than learning the truth at the beginning, that’s just how reality is, but any family would have done it this way, putting the child’s future first. Poor parents. White-lies are already passe, doesn’t the editor know? All of society is a false facade! I trust this child can understand his family’s white-lie! May he get a good score [on his gaokao college entrance exam]! Sigh, the evil gaokao system! Reading this made me sick! Even if you do well on the gaokao, you still can’t compete successfully with second generation rich [children of wealthy families], so why bother? Is the gaokao really this important? 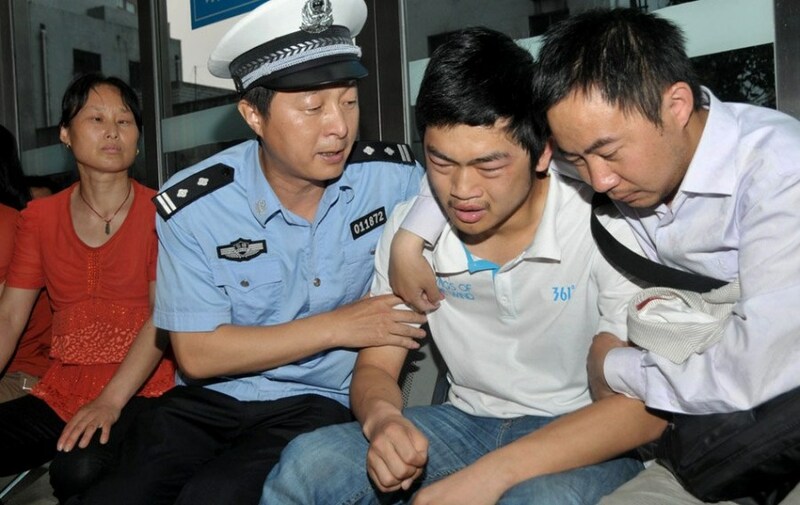 A merciless gaokao, what’s the point?! Child, your mother’s spirit in heaven will be happy for you, pull yourself together. To lose a father in one’s youth, a wife in one’s middle age, a child in one’s old age, there is nothing more painful than the departing of a loved one, a pain that rends one’s chest! Is the gaokao more important than everything, more important than the parents who gave you your own life? What have people lost these days?!!! What a dysfunctional education system, one that will only produce deformed people! The past few days of the gaokao, I’ve been outside the exam sites taking photos. Why must a single university entrance exam mobilize this many people? Why? Why? If the gaokao were treated as any ordinary test, then there wouldn’t have had to been a parents’ conference, right? Why do schools hold a parents’ conference rather than just a student’s conference? Motherfucking gaokao, go to hell! You bunch of 2B! There are many paths in life, the gaokao is but just one of them. To do well [and get into a good university] does not necessarily mean everything will go smoothly in the future. If you don’t do well, there are still other options!! Why make it so morbid/dysfunctional!!! A mad system, a mad people. Sigh, people’s humanity has all been twisted. In the face of anything, we must all make way for and serve the “gaokao“! As if the gaokao is more important than all and everything! What do you think? Given a similar situation involving something you feel is critical to a child’s future, would you temporarily deceive the child about something as important as a parent’s death?